Hi. Name’s Wulf, Wulf Moon. Let’s make it easy. Call me Moon. I wrote my first hard science fiction story when I was fifteen. It became a winner in the national Scholastic Art & Writing Awards–the same contest that first discovered Stephen King, Peter S. Beagle, John Updike, Joyce Carol Oates, and a host of iconic names in the Arts. This became my first professional sale when it was published in Science World. Since then I have won more than 30 awards in writing (ditto in public speaking), the largest being a full scholarship to a private college—a good thing to happen to a kid in a foster home. After college, I had many businesses, including working as a full-time freelance writer and artist. Through my companies, I have written and produced creative newsletters, brochures and manuals for financial marketing firms; designed corporate logos for some of the biggest startups in the nation; had my own studio and waterfront gallery on some beautiful islands; and created and marketed my own line of artistic greeting cards sold in gift shops. 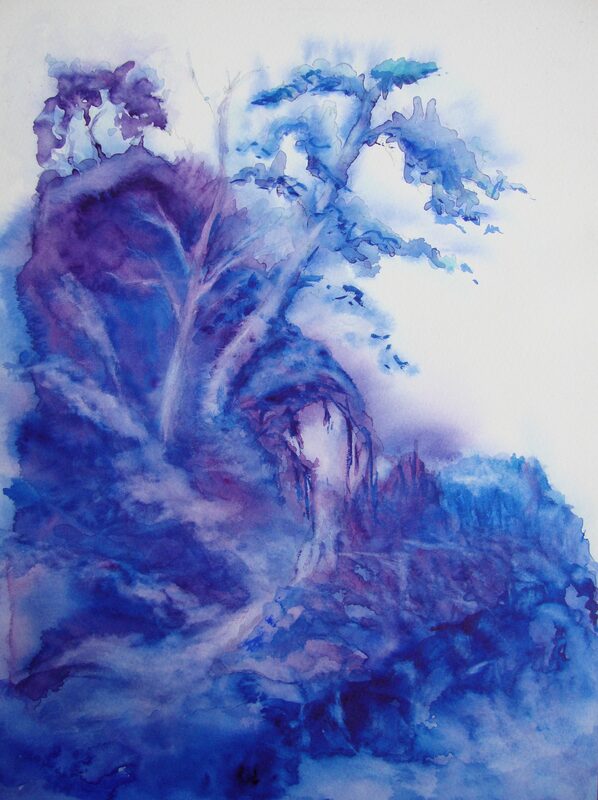 These days, my focus on art is watercolor, my focus on writing is speculative fiction. Yeah. Space ships and dragons. Want a piece of me? Read my work. My science fiction story “Seventh Heaven” was published by Simon and Schuster’s Pocket Books Division in the anthology Star Trek: Strange New Worlds II. A Borg love story. What could be sweeter? Third Flatiron Publishing bought my story “Beast of the Month” for the anthology Strange Beasties, released September 20, 2017 in e-book and trade paperback (it was also reprinted in Third Flatiron’s Best of 2017). My story was also selected for podcast, and I was hired to read it. Some quiet night when you ease back in your armchair and turn down the lights, let me read you a story. Take your pick, they’re here, on my podcast page. My conquistador fantasy story, “War Dog,” was published by Third Flatiron in TERRA! TARA! TERROR! in October, 2018. In 2019, two-thousand readers from around the world voted in the Critters Annual Readers’ Poll. “War Dog” won Best Science Fiction and Fantasy Short Story of 2018. I am honored so many read my story or listened to the podcast from Third Flatiron and gave it this large category award! But wait! There’s more! In the fall of 2018, I won the international Writers of the Future contest, Volume 35! Thousands of writers from around the world compete in this international talent search each year by submitting stories in speculative fiction. Winners are judged by bestselling authors in the industry like David Farland, Kevin J. Anderson, Orson Scott Card, Larry Niven, Tim Powers, and many more. We are flown to Hollywood where we enjoy a week long workshop with top experts in the field, culminating in an awards banquet and gala ceremony many have dubbed “the Oscars of science fiction and fantasy.” And, our stories will be published in a bestselling anthology, Writers of the Future, Volume 35. Many of the biggest names in science fiction and fantasy got their start by winning this contest, as you can see in this list of their newest science fiction books. I am happy my story, “Super-Duper Moongirl and the Amazing Moon Dawdler,” will be read by tens of thousands worldwide. Here’s a weird trivia bit about my writing. In 1996, I won Grand Prize in the “Contest Corner Prose Contest,” which was likely the first major online flash fiction contest. It was sponsored by AOL, judged by a panel of twenty pro fiction writers and editors. Over the course of that year, thousands of writers including novelists, journalists, lyricists and composers entered the weekly contests. At the start of each week, you were given a one word theme, by the end of the week, you posted your story. The judges awarded prizes to the top three each week, and I’m happy to report I placed in those top three almost every week I entered. But the big deal was what they called Writer of the Year, where first place winners from each week were compiled and judged for that year’s Grand Prize. Two of my stories placed in the Top Ten, one of them taking the title of Writer of the Year and the grand prize worth thousands of dollars. Oh, and then the editor at The Rose and Thorn, one of the best online literary magazines of the day, published the story that placed just under my grand prize winner. It was a Really Big Deal back then. But wait! There’s more!